When implementing Office 365 for your business, you are inundated with options—do you opt for Business Premium or E3, or how do you decide between E3 and E5? Each of these plans come with different features and pricing structures, but those in charge will likely have one important question: How do I turn the Office 365 pricing into real value for my business? In partnership with Forrester Research, Microsoft conducted a survey of 63 organizations utilizing Office 365, in addition to a number of Microsoft consultants, to create a “composite enterprise” they’re calling Acme. Acme is a piece of fiction, but the numbers behind the story are real. According to Forrester Research, Acme deployed Office 365 to 2,500 employees, and realized a three-year return on investment (ROI) of 163 percent. There was a 468 percent internal rate of return (IRR) and a payback period of only seven months. 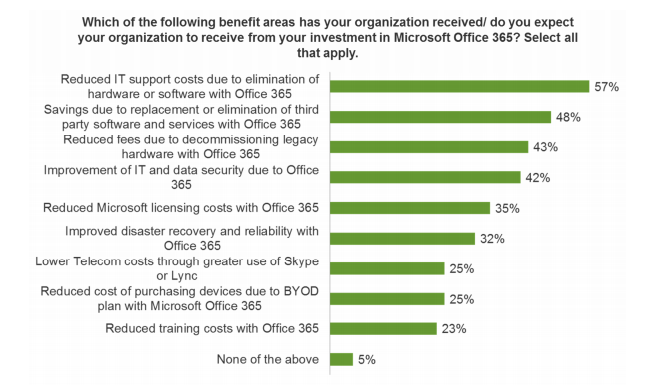 57 percent of those surveyed by Forrester Research expected or received benefit in reduced IT support costs due to the elimination of hardware or software after deploying Office 365. In aggregate, those companies surveyed saw an 11.9 percent in IT support costs for legacy systems. Because more people are bringing their own devices into the workplace, the cost of user licences becomes a real concern. Because a single Office 365 licence is good for up to five devices, that equates to less licences and significantly reduced costs. One business was using Lotus Notes and on-premises Microsoft solutions, and was able to cut annual license costs by $1 million using Office 365. Because Office 365 is in the cloud, there’s lower to no need for IT teams to constantly tinker with the deployment to help keep it online. That saves IT members time to focus on more important work—doubly so when other employees find themselves running into fewer and fewer technical issues. 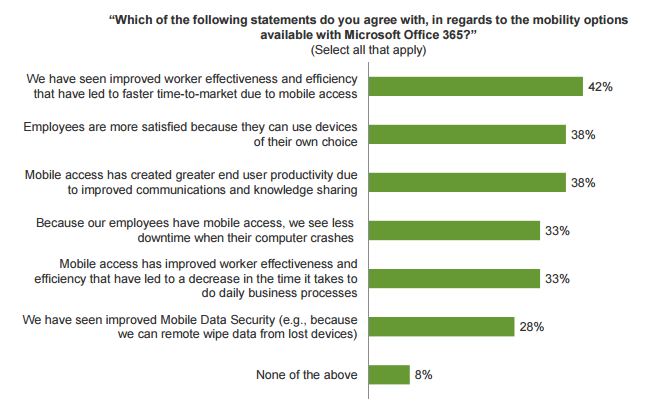 Aside from reducing costs across the board, Office 365 is proven to help employees get more work done with the time they have. This is especially true for mobile workers. Software and professional services companies often have teams of highly mobile salespeople or consultant engineers who must be on the road for a majority of the year to help make sales or implement new services, and any efficiency gains for these high-value workers could make massive dividends. Office 365 helps get rid of complex and clunky VPNs and helps employees work more productively from anywhere around the world, at any time of day. In the end, the risk-adjusted total benefit over three years, averaged across the companies surveyed, was $2,811,375. If you haven’t taken the leap into Office 365 quite yet, whether or not pricing was your main concern, we hope this has illustrated the value and ROI that’s well within your reach. To make the opportunities even greater, we’re able to offer a truly excellent deal on new Office 365 deployments: through June 30, 2017, we’re offering free Office 365 implementations and a discounted first month of licences. Want to learn more or get started? Get in touch and one of our Office 365 consultants will start you on the path toward real value in the cloud.